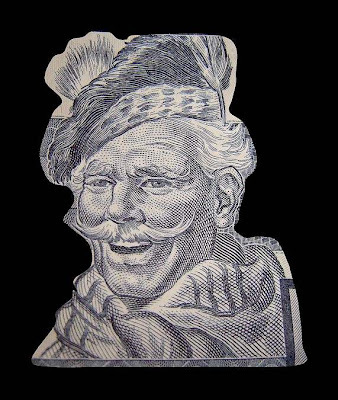 I will begin the way I planned to begin, by celebrating the deeply cool and truly moving spectacle that is $5 of Canadian Tire money displayed with style. 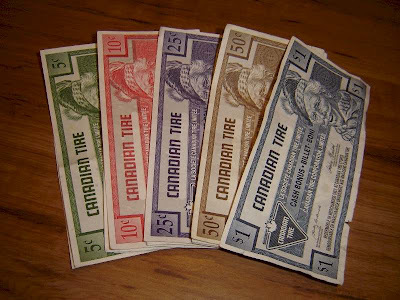 For your information, $5 Canadian Tire (CT) money is not "cheap": the amount of it you get back varies from franchise to franchise, but let's say you are getting the maximum, 2% of purchases. My family spent at least $250 at CT to generate this prize! If that view wasn't doing anything for you (as if! 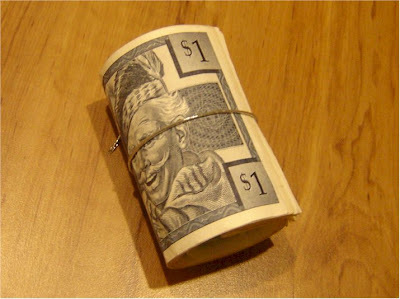 ), how about that same money rolled up? 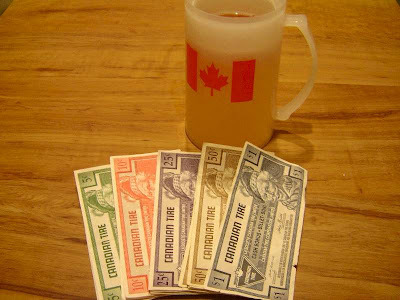 I know you're probably already freaking out with joy-joy madness after seeing that CT money in such alluring and attractive ways, but what if I threw in a beer in a freezer-coolie mug thing? What happens to your brain then, huh? Can you stand so much goodness in one photo? If you thought that was just stupid, you should know that I was seriously considering taking pictures of the CT money with all kinds of different "Canadian" items, and was only stopped by the soothing, calming influence of my sweet wife. You should thank her. Since I should have known that the prize would have that kind of soul-twisting and ethics-bending power, I am not prepared to excommunicate this visitor altogether. They did, after all, confess what they had done and didn't blame a trainer, a doctor, or the other competitors in the process. I do not condone such behaviour, however, and should I run any more contests on this blog, this individual will be prohibited from participating. There is a zero tolerance doping policy on the Tour de RANTWICK. Since our doper is disqualified, the entrant with the second most votes, and the winner of RANTWICK's first and last CAPTCHA contest is Rollz, with the most excellent captcha "spipbra"! Although we have never met in person, I happen to know that Rollz is a local London bike commuter, and owner of the blog Bike Commuting London Ontario. I'm hoping you are still reading this blog Rollz, because I don't see an email address attached to your profile... comment please so I can hand over or mail out your prize! Captcha doping? Where will all this end! Welcome back. "I was seriously considering taking pictures of the CT money with all kinds of different "Canadian" items, and was only stopped by the soothing, calming influence of my sweet wife. You should thank her. Thank you, thank you THANK YOU, Mrs. Rantwick! Was the contest rigged to favor a regional contestant? Perhaps there is a bit of French influence around there? See, I could never be a professional athlete because I am too afraid of needles! Steve - I know, I know. Tsk Tsk. 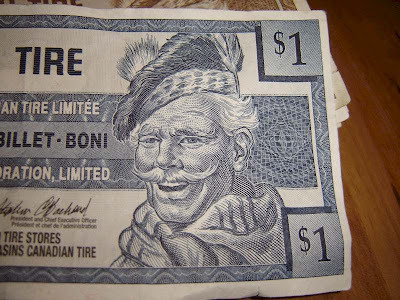 Chipseal - In fact I was rather disappointed not to be sending the Canadian Tire money to somebody other than a Canadian citizen who probably has a big stash of the stuff already. Unforunately the decidedly un-french, American contestant who was looking like they might win cheated anyway, and I ended up going local. I will pass your thanks on to my wife, and I am glad to be back, thanks! Are you still being presented with captchas on my site? I thought I had turned them off. Maybe they're left on specially only for ChipSeal. It didn't give me that "are you human?" test. I am just making them up as a lark! ChipSeal. I am afraid, my friend, that you are AT LEAST as weird as I am. I have to say I am stunned. I have never won anything in my life. I will not let the doping scandal tarnish this victory as I know I competed fairly. However I cannot accept the prize as it would jeopardize my amateur status. Rantwick I would like to see you drop the five in the donation box next time your at Canadian Tire. I am not sure what charity the money goes to but that seems appropriate. I knew I had a good chance with [spipbra]. It may make all your readers happy to know that even though I am a local resident I can add and american flavour or (flavor as they say) to the contest because I am a U.S. citizen. Take that, everybody! Rollz is both a US Citizen and a stand up guy! I will do as he suggested, and the $5 CT money will go to charity.